When installing hardwood flooring in your home, there are a number of things you will need to consider. When installing hardwood flooring in your home, there are a number of things you will need to consider. The more you plan in advance, the fewer headaches you will have down the road. Here are just a couple of the things you will need to consider before installing your hardwood flooring. What species will work well in my home? Think about the area you live in, specifically the climate. Some species are better suited to certain climates than others. Next, think about your personal style and your lifestyle. If you want darker flooring, mahogany and walnut are both good dark choices. If you have a more active lifestyle, harder species such as Brazilian Cherry, Hard Maple, or Cumaru may suit you better. Your hardwood flooring specialist will be able to help you choose if you are unsure of what wood species will work best for you. How do I keep my hardwood from being damaged? If you have an active family with small children and pets running around all the time, then you will want to protect your new hardwood flooring from all of that. A quick and easy fix is to put down rugs in the areas that receive the most traffic. If you notice small scratches, you may be able to fix them with a wax stick. Larger scratches will require a repair. One of the most frequent questions customers ask is “How much will it cost?” The cost depends on many, many factors. 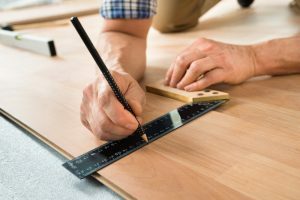 To give yourself an estimate of how much you’ll need to budget, you first need to measure the amount of flooring you will need. Multiply that number by the price per square foot of the flooring you’re considering. Finally, don’t forget to add a few extra dollars on for things like moldings and thresholds for doors. That is about how much it will cost for the materials. This entry was posted on Friday, February 2nd, 2018 at 12:57 pm. Both comments and pings are currently closed.